Pottstown’s got its radio station back. After going silent more than a year ago, WPAZ at 1370 AM returned to the airwaves yesterday afternoon. Check out The Mercury’s coverage here. After months of hard work and negotiations, the nonprofit WPAZ Preservation Association changed its name to Community Broadcasting Group and recently purchased the station from Four Rivers Broadcasting. General Manager Rick Rodgers and Station Manager Ross Landy have planned a line-up of old and new shows and increased local sports coverage within a 24/7 interactive format. The tentative official “opening” will be January 8th; keep an ear out then for new and returning personalities and shows. In the meantime, they’ll be running music and promos. The station’s website is wpazradio.com. And you can find them on Facebook here. Congratulations to Rick, Ross and everyone involved – looking forward to the programming! As some of you may know, I recently opened my big mouth and said I would jump in the Schuylkill River on January 1st during Pottstown’s Parks & Rec Polar Bear Plunge. You can read all about the Plunge in the Mercury article here. Weather.com is calling for a partly sunny day on Saturday, high around 47 degrees. Not too bad for January 1st… I guess. The thing is, I don’t really like swimming unless the air temp is, like, 97 degrees and the water is about 90 degrees. Right about now I’m getting cold feet just thinking about this Plunge. So, I’m looking for some feedback in the poll below. Please, don’t be cruel. Cut me some slack. Think about my overall health and wellness. Help me find a way out of this! There’s still time to fill out the quick-and-easy application form to be considered for a scholarship to the upcoming Small Business Workshop Series taught by the local chapter of SCORE. SCORE is run by volunteers who have had successful careers in business; they pass their experience and knowledge on to entrepreneurs in workshops and through individual counseling sessions. Positively!Pottstown is offering two scholarships to Pottstown-based businesses for the next series, which begins on Jan. 10th at the Tri-County Area Chamber of Commerce at 152 E. High Street. The 4-workshops and business plan manual offered by SCORE have a $100 value. The application can be downloaded below. You can either email it to positivelypottstown@gmail.com by midnight tomorrow, Dec. 28 or get it in the mail so that it’s postmarked by Dec. 28th. Mail it to Positively Pottstown Blog, P.O. Box 1509, Pottstown, PA 19464. I had a stomach bug for the better part of the past week and just started feeling better yesterday, which meant I got way behind in baking cookies. 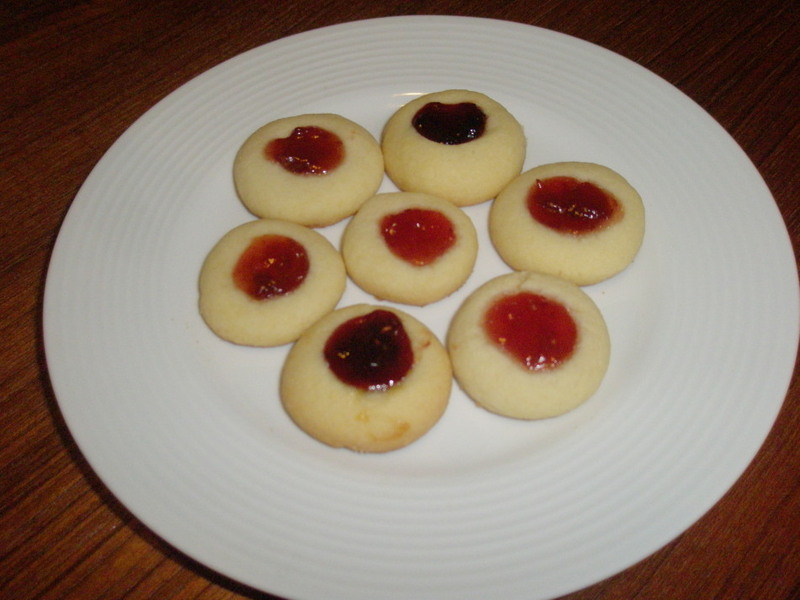 I’m catching up today, and the first batches were these melt-in-your-mouth butter cookies with a tiny dollop of jam in the center. For me, they mean “Christmas” because that’s the only time my mom makes them and so do I. An added bonus this year was using the strawberry jam made by my sister-in-law – thanks, Megan! I also used a store-bought four-fruit preserve. Enjoy! Measure flour and salt into large bowl. Cream butter & sugar well with mixer. Add egg yolks. Mix well. Add vanilla. Add flour 1 cup at a time, mixing well between additions. Form into balls the size of a quarter. Place on slightly greased cookie sheet and flatten slightly with palm. Press in center with thumb or fingertip. Be careful not to crack the dough around the edges or the jam will run out the side. Fill with a berry, cherry or apricot jam. Bake at 350 degrees for about 10 minutes or until brown around edges. Reverse baking sheets once during baking. Keep an eye on the jam. If you keep these in too long, the jam evaporates too much and then the cookies look kind of sad. 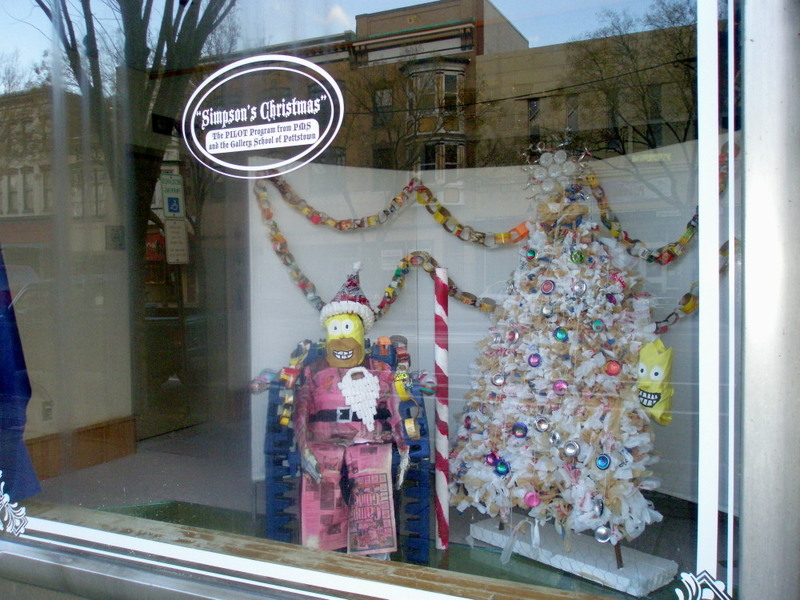 Here’s a humorous take – “A Simpson’s Christmas” – courtesy of the Pottstown Influential Leaders of Tomorrow (PILOT) program and The Gallery School. the joy, warmth, love and hope that this day brings. Last week I made a mad dash to The Gallery to do some holiday shopping and was once again astonished at the totally cool, handmade jewelry and fused glass that they offer at really reasonable prices. 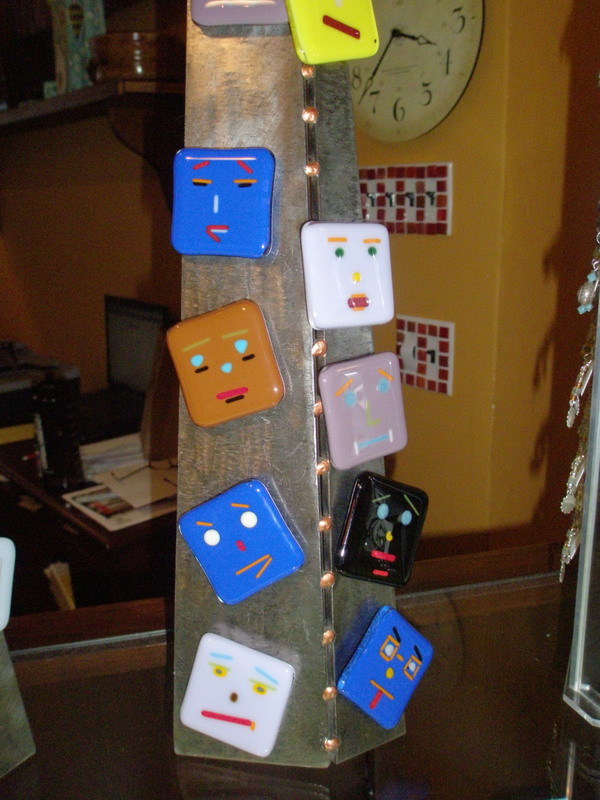 They had these cute magnets – perfect stocking stuffers – for just $5! I got a couple of glass items and a pair of earrings with prices ranging from $15-$30. They were also offering some Christmas-themed glass (shown below) in the same price range. This week you might get an even better deal. 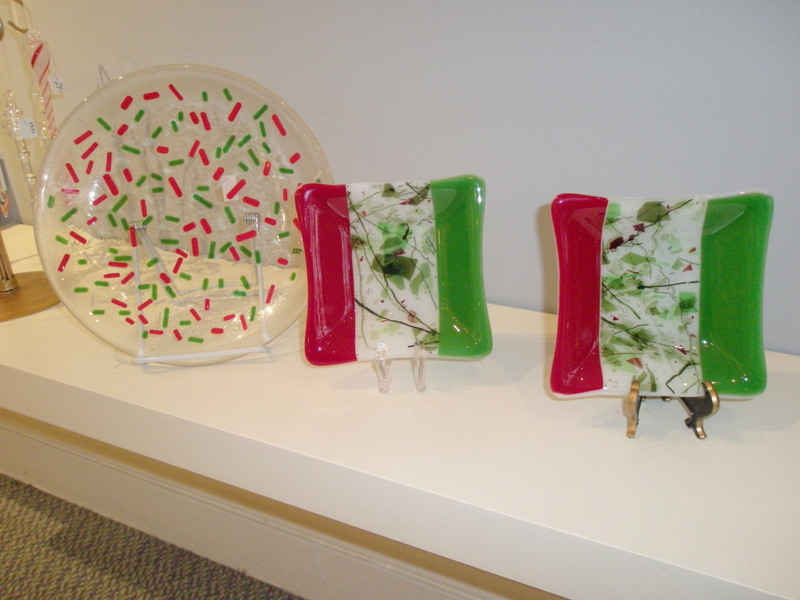 Today through Friday, 12/24 the Gallery is offering 25-40% off a wide selection of items. No coupons needed, just stop and shop. They have gift certificates valid for any item or for one of their many classes, so you can give the gift of art this Christmas! The Gallery‘s hours are: Tuesday-Thursday 10am-4:30pm and Friday 10am-2pm. They are closed 12/25. They are located at 254 High Street. Phone number is 610-326-2506. And if you need to add that special, finishing touch to your Christmas table or are looking for a lovely plant as a hostess gift, stop by the Pottstown Florist at 300 E. High Street in the Farmers’ Market building at High and Charlotte Streets. 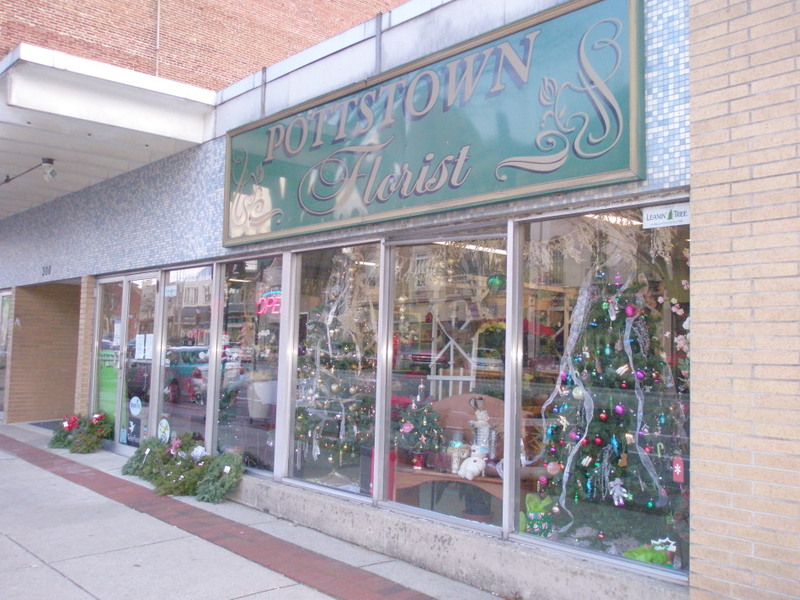 Or check out their website – www.pottstownflorist.com – and give a call to place your order (610- 323-0101). Note: This is the third article in a four-part series on Childhood Obesity presented by the Pottstown Area Health & Wellness Foundation. Corresponding Webisodes are available for viewing on www.missionhealthyliving.org. STATE AND LOCAL LEVEL TO FIGHT THE EPIDEMIC? Back in 2004, The Child Nutrition and Women, Infants and Children Reauthorization Act required that all education agencies develop wellness policies to address childhood obesity by the start of the 2006-2007 school year. Districts nationwide had to create at least one goal to improve wellness in the following categories: nutrition education, physical activity, availability of nutrition guidelines to students, and other school-based activities to address student wellness. “Pennsylvania was one of the few states that actually collected and analyzed plans to ensure they addressed this problem of childhood obesity,” said Elaine McDonnell, projects coordinator, Project PA. “If school districts [in Pennsylvania] sent goals that did not meet state standards, the schools had to rework those plans.” Project PA was a collaboration between Penn State University’s Department of Nutritional Sciences and the Pennsylvania Department of Education, Division of Food and Nutrition. The team partnered with schools and their communities to provide sound nutrition education and to promote children’s healthy eating behaviors. Pennsylvania school districts set goals and improved snacks and a la carte offerings to meet this required federal legislation for reducing childhood obesity. The state’s multi-faceted approach included mandatory training sessions for all school food service directors and financial incentives to schools that adopted state-created nutrient standards for the a la carte food items offered at the school. Ultimately, nearly all school districts worked with the state to formulate plans that would target obesity in some way. While Pennsylvania schools addressed and improved the food available through vending machines and a la carte offerings, they still were missing opportunities for physical activity, which did not improve. A recent White House Task Force on Childhood Obesity Report to the President, Solving the Problem of Childhood Obesity Within a Generation, released some startling information—childhood obesity has become an epidemic in America and it is now considered a national health crisis. The report presents a series of specific recommendations, two of which involve school involvement—providing healthy food in schools and getting children more physically active through physical education, recess and other after-school opportunities. Currently, the Pennsylvania Department of Education has new legislation in draft form under Chapter 12 that, if passed, will require schools to establish and maintain wellness committees to assess, plan and implement, monitor district and school health and wellness policies and programs. This will include setting up goals and measuring success in the areas of nutrition and physical education at the elementary, middle and high school levels. What Are Our Local Schools Doing? The local school districts have been involved in addressing childhood obesity on a state level for many years. However, the local schools in Pottstown and those within a 10-mile radius have another advantage that most schools in Pennsylvania, even the nation, don’t have—grant funding available through a Foundation. The Pottstown Area Health & Wellness Foundation provides grants, programs and educational resources to the Pottstown Area to enhance the health and wellness of area residents—but that did not include giving grants to schools in the very beginning. There are many area schools using grants from the Foundation to improve the health and wellness of students. For more information about the programs offered for students and parents, please go to the school’s website. About the Series – Childhood Obesity This four-part article series was developed by the Pottstown Area Health & Wellness Foundation. Corresponding Webisodes featuring local experts can be found on http://www.missionhealthyliving.org. The first article discusses how childhood obesity has become a national epidemic. The second article discusses the risks, warning signs and long-term effects of childhood obesity. The final article will focus on what parents and children can do to start to change their habits, lose weight and live healthier lives. About the Foundation The Pottstown Area Health & Wellness Foundation’s mission is to enhance the health and wellness of area residents, providing education, funding and programs that motivate people to adopt healthy lifestyles. Visit www.pottstownfoundation.org for more information about the Foundation. Discover Pottstown area’s new online community at http://www.missionhealthyliving.org to learn and share great information on how to lead a healthier life! Here’s a link to the Pottstown CLT website. It’s a work-in-progress. A PowerPoint presentation will be posted there after the Monday meeting. This Monday, Dec. 20th, there will be a joint School Board & Borough Council Meeting at 7:30pm at the Pottstown Middle School in the 2nd floor LGI room. The agenda will include an update to the community on the PAID partnership, a presentation about a Community Land Trust for Pottstown, and tax assessments. I will be part of the group that is doing the Community Land Trust presentation. While most CLTs have as their main goal the creation of permanently affordable, owner-occupied housing in places where housing prices are high or escalating, a CLT for Pottstown would undertake a broader range of activities such as community gardens and economic development initiatives to help bring back market-rate activity. With input from the community, a CLT for Pottstown would undertake activities in a targeted way to slow the negative fiscal spiral and coax the market back. Many aspects of this approach have been recommended in study after study. I’m certainly looking forward to carrying on this conversation & to hear questions and observations from the larger community about how this could work. Hope you can make it Monday night!